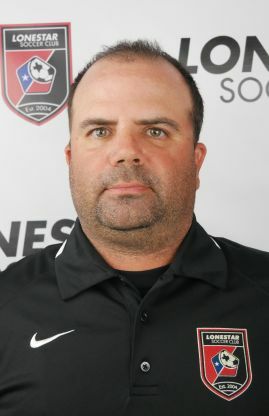 Stephen Bailey is an original Lonestar Soccer Club trainer and coach since its inception. Steve has coached at every level including the highest youth and collegiate level. He is no stranger to the Austin soccer community coaching previously at CC United, Longhorns and the Warriors. As a player, he played club locally with the Capitals and Flyers, he was named SISL Rookie of the Year at age 15 and earned All-Star honors. Steve played collegiate soccer at St. Edward's University and later went on to become a pro where he finished his professional career with the USL Austin Lonestar Men's team. Steve's knowledge of Austin soccer makes him a critical component of the Lonestar staff. He was integral in sending numerous players to the collegiate level from previous teams he's coached. Steve adds, "I have been fortunate that soccer has given me many opportunities in life that I may not have been able to achieve otherwise. I have had many achievements on and off the field, but the greatest is seeing player’s development, reach their goals they have set for themselves and know that they have really enjoyed playing the game."